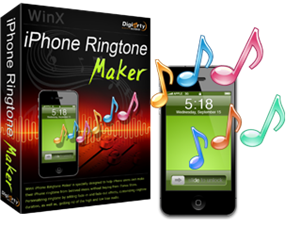 WinX iPhone Ringtone Maker is a professional and innovative iPhone ringtone creator program from Digiarty. The iPhone Ringtone Creator program has been designed to convert audio to iPhone ringtone file. It supports most of the popular audio formats such as MP3, WAV, WMA, OGG, AAC, MP4, M4A, FLAC, FLA, MPC, MP+, MPP, AIFF, AC3, APE and etc. The program has been improved with the customization option for adding fade-in, face-out-effect, increase or decrease the original audio volume and etc. Able to create ringtone for iPhone, iPhone 4, iPhone 3GS and iPhone 3G. Convert all prevailed audio to iPhone ringtone. Add fade-in, fade-out effects and customize duration. Powerful DSP function for beautifying the ringtone. Support looping play and writing tag information. Supports Windows 7 (32 & 64 bit), Windows Vista (32 & 64 bit), WinXP, Win98, WinMe, Windows NT and Windows Server. Once completed download, install it and click on the “Register” button to activate it. Registration code is pre-integrated and thus not needed. For those who have missed out the above giveaway, can follow the below steps to get the free registration code of WinX iPhone Ringtone Maker until 31 December. Activate WinX iPhone Ringtone Maker with registration name “WINXGIFT” and license key code “LG0E8-EECEE-A5A27”.